Welt| GEHEIME ABSPRACHEN: Freiwillige Selbstkontrolle für Irans Atomwaffen? Der Iran-Deal soll Atomwaffen durch Inspektionen verhindern. Nun berichten US-Medien über Geheimabsprachen: Der Iran dürfe sich selbst kontrollieren. Unter Leitung eines angeblichen Bombenbauers. Kaum eine Militärbasis wird so direkt mit dem vermuteten iranischen Atomwaffenprogramm in Verbindung gebracht. Bei keiner Anlage haben internationale Atomkontrolleure so oft und so nachdrücklich Inspektionen gefordert. Keine iranische Einrichtung ist so brisant wie der Militärstützpunkt von Parchin südlich von Teheran. Und ausgerechnet ihn sollen nach der Einigung im Atomstreit nicht unabhängige Wissenschaftler kontrollieren dürfen – sondern die eigenen Experten des Regimes. Ist der viel gerühmte Atomdeal mit dem Iran weniger ein bindendes Kontrollabkommen, sondern eher eine Art Freiwillige Selbstkontrolle? Diesen Schluss legt ein Exklusivbericht der amerikanischen Nachrichtenagentur AP nahe, über den auf drei Kontinenten heftig gestritten wird. Seit 2002 verdächtigt die internationale Gemeinschaft das Regime in Teheran, unter dem Deckmantel eines zivilen Atomprogramms heimlich an Massenvernichtungswaffen zu arbeiten. Weil sich das Land jahrelang gegen Kontrollen der Internationalen Atomenergiebehörde (IAEA) sperrte, wurde es schließlich mit schmerzhaften Wirtschaftssanktionen belegt. Im Atomabkommen vom Juli erklärte sich das Land im Gegenzug für die Aufhebung der Sanktionen bereit, sein Atomprogramm erheblich einzuschränken und für mehr als ein Jahrzehnt umfassende Inspektionen zuzulassen. Und bevor dieses Geben und Nehmen beginnt, muss der Iran laut Vereinbarung der IAEA Kontrollen ermöglichen, mit denen der Verdacht früherer Arbeiten an Atomwaffen aufgeklärt werden kann. Um diese Inspektionen geht es nun. Kommentare deaktiviert für Welt| GEHEIME ABSPRACHEN: Freiwillige Selbstkontrolle für Irans Atomwaffen? Gatestone| Iran’s Views of Jews and the U.S.
Iran’s imminent nuclear breakout capability will, of course, come with insufficient notice for anyone to stop it. With its new intercontinental ballistic missiles, Iran can deliver these nuclear warheads to every capital of Europe. It does not even have to do that. It need only threaten to, while spelling out what it wants. 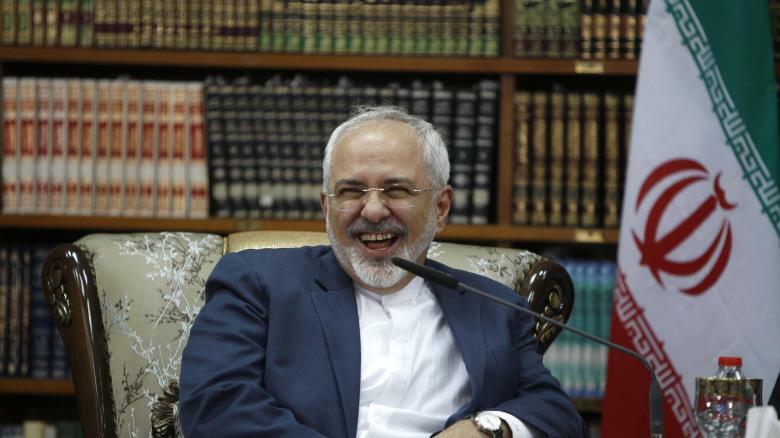 Doubtless, Iran has also put the „Great Satan,“ the U.S., high at the top of its list. Christians and Jews are familiar with the biblical narrative of how the ancient ruler of the Persian Empire, Cyrus, granted the Jewish people their freedom after his conquest of the Babylonia in 538 B.C. His proclamation launched the most meaningful „aliyah“ [going up to Israel] until modern times. 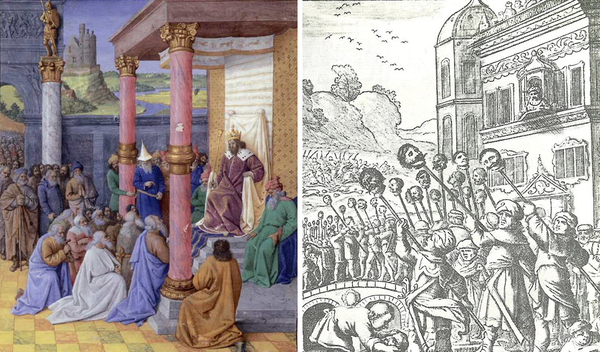 The Persian ruler even contributed treasure to help finance the rebuilding of Solomon’s Temple in Jerusalem, which had been destroyed by the Babylonian king, Nebuchadnezzar. There is, however, a different narrative. When Zoroastrianism was declared the official state religion during the Sassanid Dynasty (224-651 A.D.), the plight of Iran’s Jews deteriorated. This fusion of state and religion gave Zoroastrian clerics more political power than the monarchy. It also led to the enforcement of intolerant uniform rules of worship for all of Persia’s citizenry. That persecution clearly shows that Iranian „Jew-Hatred“ predates the birth of Islam. Professor Shaul Shaked details pre-Islamic Sassanid Era polemics against the Jews: The Sassanids burned synagogues and outlawed the celebration of the day of rest, Shabbat. One Sassanid monarch, „Feroz the Wicked“ (Reshi’a), had most of the Jews of Isfahan murdered  — in the very city where the biblical heroine, Esther, and her cousin, Mordecai, are buried. Later, in most of the Safavid (1502-1736) and Qajar (1781-1925) dynastic eras, the monarchs‘ relationship with Iran’s Jews was at best problematic. After the conversion of Iran’s Muslims to the Shia sect of Islam, Jews, like other non-Shia minorities in Persia, were forced to live asdhimmi (tolerated, second-class citizens). For centuries, there were forced conversions, the closing of synagogues, and destruction of Hebrew books Outward signs distinguished Jews from the rest of Iran’s „loyal“ citizens. Throughout the Safavid Era, Iran’s Jews were forced to wear colored hats and non-matching shoes. In 1588, under the Safavid Shah Abbas I, restrictive ordinances against Jews were instituted, which came to known as „Jam Abbasi Laws,“ severely limiting Jewish property rights and professions in which Jews could work. Sometimes anti-Jewish feelings resulted in the often deadly Yud Bazi (Jew Game) or Yud Khost (Jew Murder). Attacks occurred: Muslim Imams whipped up their followers in anti-Jewish diatribes. The 6th century B.C. Persian Emperor Cyrus, who granted the Jewish people their freedom, is pictured at left in the painting „Cyrus II le Grand et les Hébreux“ (by Jean Fouquet, 1470-1475). The Persian Safavid ruler Shah Abbas I, pictured at right reviewing the severed heads of captured Ottoman Turkish soldiers, instituted restrictive ordinances against Jews in 1588. It was not until the Pahlavi Dynasty (1925-1979) that Jews in Iran could live without threats from their own government. Reza Shah Pahlavi even rebuffed Hitler’s attempt to target Iranian Jews; and under his son, Mohammad Reza Shah Pahlavi, the last Shah of Iran, Jews lived in freedom. After the establishment of the Islamic Republic, however, Reza Shah was called a „Zionist stooge,“ and Iranian Jews were often accused of being spies for Israel. Many of Iran’s Jews emigrated to Israel, the United States, or other countries in the Free World. Although Iran is Shia and not Sunni, the same basic anti-Jewish references in theological texts are to be found in the Koran and Hadith. Both purport to justify inveterate Jew-hatred. The most familiar texts are the Koran’s condemnation of the Jews as „killers of the prophets,“„all Jews are not all bad, the good ones become Muslims, The bad ones do not.“ There are also several Hadith passages that lend theological support for virulent Jew-hatred in today’s Iran. For example, the murder by strangulation of a Jewess who speaks ill of the Prophet, is justified. These passages buttress more contemporary assaults on Jews by Iran’s Islamic revolutionary leaders, such as those of Khomeini and Khamenei,  along with earlier condemnation of Jews and Israel as najis, [unclean infidels]. With its new intercontinental ballistic missiles [ICBMs], Iran can deliver these nuclear warheads to every capital of Europe. It does not even have to do that. It need only threaten to, while spelling out what it wants. Discovering Cyrus: The Persian Conqueror Astride the Ancient World by Reza Zarghamee. Mage Publishers, Washington D.C. 2013. p.232; and the Book of Ezra, 1:2, 6:3. According toThe History of the Jewish People: „The Aliyah of Zerubavel and the Building of the Second Temple,“ about 50,000 Jews from the tribes of Judah and Benjamin returned to the Jerusalem area. Mesorah Publications, N.Y. 1982. p.25. Terua: The History of Contemporary Iranian Jews: Vol. I. Center for Iranian Jewish Oral History, Beverley Hills, California. 1996. p.14. „Zoroastrian Polemics Against Jews in the Sasanian and Early Islamic Period“ by Shaul Shaked. Padyavand, Volume I, edited by Amnon Netzer. Mazda Publishers: Los Angeles. 1996. pp.75-80. Terua. Vol. I „History of Jews in Iran:1500 to the Present“ by Peyman Banooni & Sammy Simnegar. p17. New Society: Harvard College Student Middle East Journal „Jews of Iran Under Islamic Rule“ by Victoria Golshani. p.1. Ibid. p.1. See also Dhimmi Status and Jewish Roles in Iranian Society by Lawrence Loeb. Salt Lake City, Utah. Gordon and Breech Science Publishers: 1976. p. 92. One Yud Bazi game during Muslim festivals in the Qajar Era featured throwing Jews into a large pit of muddy water (hauz) for the amusement of onlookers, who would then watch these poor half-drowned souls climb out of the hole. Terua. Vol. I. p. 26. „Yud Khost“ simply means „Jew Death“ in Persian, an unconscious historical precursor of the mid-1930s in Germany. Personal Interview of Boghrat Khorsandi by Victoria Golshani, 28 September 2000. Padyavand Vol. I. p.122. „The Events of 1978“. Koran surah 2, al-Baqarah/The Cow. Verse 61b, verse 83, verse 91, surah 3 al-Imran/The Family of Imran, verse 21 are just a few of the Koranic passages that accuse the Jews of murdering Allah’s prophets sent to them. Koran, surah 3, al-Imran/The Family Imran, verse 113. Hadith, Abu Dawud 3, #4349. Terua. p. 16 and p. 22. Also, see Iran’s Final Solution for Israel by Dr. Andrew Bostom and „Jihad, Najis, & Islamic Jew-Hatred„, 31 January 2015. Kommentare deaktiviert für Gatestone| Iran’s Views of Jews and the U.S.
Republikanischer Wahlsieg erleichtert neue Sanktionen. Washington. Die Verhandlungen der USA, Großbritanniens, Frankreichs, Russlands und der EU mit dem Iran über die Beendigung seiner Atomwaffenpläne erhalten durch den Sieg der Republikaner bei den Kongresswahlen neue Dynamik. Jahrelang hat Harry Reid, der demokratische Mehrheitsführer im Senat, verhindert, dass Gesetzesvorschläge für neue Sanktionen auf dem Tisch von Präsident Barack Obama landen. Reid wird nun vom Republikaner Mitch McConnell ersetzt, den Vorsitz im außenpolitischen Ausschuss übernimmt sein Parteikollege Bob Corker. Einen Vorgeschmack auf die auch gegenüber Obama härtere Gangart des neuen Kongresses lieferte die Weiterleitung eines vertraulichen Briefes des Präsidenten an den iranischen Führer, Ayatollah Ali Khamenei, an das „Wall Street Journal“, in dem er um Hilfe im Kampf gegen die Terroristen des Islamischen Staates bittet. Diese Indiskretion, die aus dem Kongress stammen dürfte, bringt Obama unter Druck, bis zur vorläufig auf den 24. November gelegten Frist für eine Einigung keine neuen Zugeständnisse zu machen. Ob Fortschritt möglich ist, hängt nun von einem Treffen der Außenminister der USA und des Iran, John Kerry und Javad Zarif, am Sonntag im Oman ab. From the shooting down of an Iranian commercial airline to the development of Iran’s nuclear program, below is a timeline of the historical moment’s post 1979 that have formed the present-day relationship. The US-backed Shah of Iran, Mohammed Reza Pahlevi, is forced to leave the country on 16 January following months of demonstrations against his rule by secular and religious opponents. Two weeks later, Islamic religious leader Ayatollah Khomeini, who referred to America as the “Great Satan”, returns from exile. Following a referendum, the Islamic Republic of Iran is proclaimed. Angered by the Carter administration allowing the recently deposed Shah into the United States, the revolutionary group Muslim Student Followers of the Imam’s Line occupied the American embassy in Tehran and took 52 American diplomats hostage for 444 days. On April 24, 1980, a failed rescue – Operation Eagle Claw – resulted in the deaths of eight American servicemen and one Iranian civilian. The crisis ended with the signing of the Algiers Accords in Algeria on January 19, 1981. The United States end diplomatic relations with Iran, a break which has yet to be restored. United States implicates Hizbollah, an Iranian movement formed at the time of the Iranian Revolution, in terrorist attacks against the US. Attacks included the United States embassy bombing in Beirut, Lebanon, that killed 17 Americans, and the Beirut barracks bombing which killed 241 US peace keepers. The US provided weapons to Iran, reportedly to fund anti-communist Contras militants in Nicaragua to help free US hostages held by Hizbollah in Lebanon. Reagan administration confirmed that weapons had been transferred to Iran but denied they were part of an exchange for hostages. US Navy guided missile cruiser USS Vincennes shot down commercial airline Iranian Airbus A300B2, killing 290 civilians from six nations, including 66 children. The US says the Airbus A300 was mistaken for a fighter jet that was outside the civilian air corridor and was not responding to radio calls. A total embargo on dealings with Iran by American companies was imposed by Bill Clinton. President George W Bush gave his infamous speech describing Iran, along with North Korea and Iraq, as an “Axis of evil”. The president warned that the proliferation of long-range missiles developed by these countries constituted terrorism and threatened the United States. Iranian opposition group reveals that Iran is developing nuclear facilities including a uranium enrichment plant at Natanz and a heavy water reactor at Arak. The US accuses Iran of a clandestine nuclear weapons programme, which Iran denies. Secretary of State Condoleezza Rice suggests that the head of International Atomic Energy Agency (IAEA), Mohamed ElBaradei, should either „toughen his stance on Iran“ or not be chosen for a third term. United States passed the Iran Freedom and Support Act, which appropriated millions of dollars for human rights Non-governmental organisations working in Iran. Ahmadinejad sent a personal letter to President Bush to propose „new ways“ to end Iran’s nuclear dispute. Both Condoleezza Rice and National Security Adviser Stephen Hadley dismissed it as a negotiating ploy and publicity stunt that did not address American concerns about Iran’s nuclear program. Ahmadinejad invite to President Bush to a debate at the UN General Assembly was rejected by the White House. US government imposed sanctions on Bank Saderat Iran barring it from direct or indirect dealings with American financial institutions due to its reported connections with Hizbollah. Further sanctions on the financial sector were imposed by the US and EU in 2012 over Iran’s nuclear development. Iran’s top diplomat Foreign Minister Manouchehr Mottaki stated that Iran is „ready to talk“ to the United States. American armed forces released two Iranian diplomats as well as seven other Iranian citizens after 305 days captured in the raid of the Iranian Consulate General located in Erbil, Iraq. Ahmadinejad described the September 11 attacks as a „suspect event“, saying that all that happened was that „a building collapsed“. Ahmadinejad issued the first congratulatory message to a newly elected American president since 1979: „Iran welcomes basic and fair changes in U.S. policies and conducts. I hope you will prefer real public interests and justice to the never-ending demands of a selfish minority and seize the opportunity to serve people so that you will be remembered with high esteem“. During a 2010 speech to the UN, Ahmadinejad sparks walkouts after he claims that most people believe the US government were behind the 9/11 attacks. Iran’s new President, Hassan Rouhani, held a phone call with President Barack Obama on a trip to the UN forum in New York – the first conversation between US and Iranian heads of state for 30 years. The US president said they both had expressed their determination to solve the long-running dispute over Iran’s nuclear programme. US President Barack Obama is said to have written a secret letter to Iran’s supreme leader describing a shared interest in fighting IS. The president also urged Ayatollah Ali Khamenei towards a nuclear agreement. It is the fourth time President Obama has written to the Iranian leader since taking office in 2009.